A Time Bandits TV series may be in the works. The Flash teases a new superpower for Barry Allen. Get a good look at the concept work behind Batman v Superman’s new costumes. Plus, Robert Kirkman talks keeping The Walking Dead faithful to the comics, and new footage of Game of Thrones filming. Behold, Spoilers! 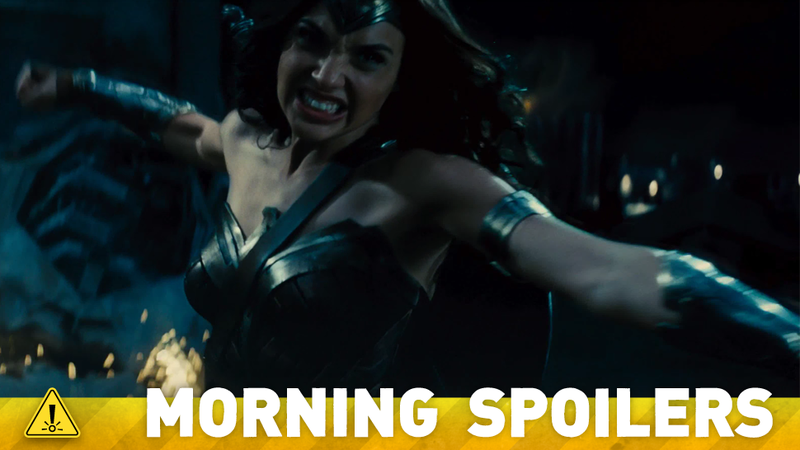 Following recent rumors that the film will go back to World War I, there’s now rumors from Den of Geek that the film will split its three different acts across three different time periods: Ancient times for scenes set on Diana’s home of Themyscira, the aforementioned World War I segment (specifically 1916), and then scenes set during the modern day. Interestingly, Den of Geek also posits that Wonder Woman will have different outfits in each time period, different takes on her classic comic book look, culminating with the “modern” outfit we see in Batman v Superman. Here’s a new viral video for Lexcorp’s “LexOS”, debuting at NYCC this weekend. For Batman, it was really important for Zack that we created a whole new Batman. And he said, ‘The most important thing for our Batman is that he comes across a real hulking, big guy.’ He’s super-pumped up. He’s going to be even bigger than Superman’s silhouette. So his strength is not through armor and gadgets and things, it is that he is a tower of muscle. Zack Snyder is a huge fan of Frank Miller’s The Dark Knight Returns and we looked a lot at that silhouette. Batman v Superman still photographer Clay Enos has released a snazzy new shot of Batman. We wanna tell more of the stories of the characters, because the characters are really interesting. You know, I think that’s what made Guardians so successful as characters. They really are interesting. They’re a little — they’re jaded. They’re just not your cookie-cutter characters. They’re definitely not boy scouts and girl scouts by any means, but I think that’s kind of what made people able to relate to them. And I think, yeah, I think definitely they want to tap into some of that some more and tell more stories, which, as a fan, I’m excited to see. Michael Ontkean will not reprise his role of Sheriff Harry S. Truman in the upcoming revival. TV Line are reporting that Robert Forster has stepped in to replace Ontkean, but it’s unknown if he’ll be playing Truman or playing a completely new Sheriff character. We are involved in two possibilities — one, a TV series based on Time Bandits, another based on a script by Richard LaGravanese and I wrote after Fisher King, called The Defective Detective. We’re currently adapting a two hour film into a six hour series. It’s about a middle aged New York cop who was once a hero who has grown fat and cynical and is in the middle of a breakdown, ending up in a child’s fantasy world where the rules of the mean streets of New York no longer apply. The best way to kill a dragon is no longer a gun, but a tree branch you think is a sword. England, 1651. The deadly Highwayman ‘The Nightmare’ and his sidekick stalk the dark streets of London. But when they find loot that’s not of this world, they come face to face with The Doctor. Who is the Nightmare in league with? And can the Doctor avoid the hangman’s noose and protect Earth from a devilish betrayal? Season 6 has a vast amount of big moments pulled from the comics. The two are very closely tied at this point. We have groups of people that have transformed at different rates with different ways of surviving, all in the same place. The people of Alexandria aren’t quite as prepared for this world as Rick and his crew are. We also have Wolves, who are perhaps closer to Rick’s group than they are to the people of Alexandria, but have a much more savage way of life. A new trailer for “The Flash of Two Worlds” features Barry utilising a new superpower—the ability to throw a concentrated dose of the Speed Force like a lightning bolt projectile. TNT have released a new trailer and poster for the show’s second season.